Publico a seguir o discurso que proferi como "guest speaker" na cerimónia comemorativa dos vinte anos do início do Mestrado Europeu de Direitos Humanos que teve lugar hoje, domingo, em Veneza, incluindo algumas passagens que, por razões de tempo, omiti na apresentação oral. It is a great honour to be here, in this solemn occasion convened to celebrate the 20th anniversary of E.ma, as a guest speaker, in my capacity of a senior member of EMA and of the first EIUC board. Allow me to start by conveying my deep gratitude to all the other founding members of the EMa, as well as to all the many people who, at some stage and in whatever capacity, contributed to the development and improvement of the master’s programme and the other EIUC activities. Among the 10 university professors of different member-states of the European Union who founded E.ma in 1997, there was one outstanding personality who made all the difference. I am referring to the late Professor Antonio Papisca from the University of Padua, who, together with Daniela Napoli, of the European Commission, was the driving force behind this project and our first director. The tribute that we pay to him today is more than fully deserved. The fortunate ones who knew him and worked with him will remind his vision and wisdom, his humanism and commitment to peace, his serene determination, his optimism, his personal kindness and gentle manners. His death represented a major loss not only to his beloved University but also to the common endeavor that he, more than any other else, personified. This tribute should be extended to the University of Padua itself, which for several years provided the necessary institutional and administrative support to E.ma, including the enrolment of students, collection of fees, organization of exams, etc., before the setting up of EIUC, in 2002, and later on the creation of the “joint degree”. Our institutional thanks should be extended to the municipality of Venice and the region of Veneto, which have provided to E.ma and subsequently to EIUC the necessary premises and financial and political support. Venice can be proud of hosting not only E.ma and EIUC but also the so-called Venice Commission, the independent expert body on democracy and rule of law of the Council of Europe (of which I was also a member). In a way, Venice concentrates the 3 pillars of the “golden triangle” of the European core constitutional values, namely, democracy, rule of law and human rights. Having been here since the beginning and having witnessed the extraordinary progress that was achieved, I take this opportunity to share with all of you a few brief impressions about what has been done, the challenges we face and the options regarding our future. The first mission of E-ma was the creation of a common European HR space and the preparation of a corps of EU HR experts and professionals. E.ma was born out of the interest of the EU to pool academic resources on human rights on a European network of universities and a center for the post-graduate teaching and research on human rights, as a means to enhance the role of the Union in this field through learning and capacity-building. Ours was the vision to create a "common European academic HR space", as Antonio Papisca put it once. Let us recall that at that time there was already a constitutional commitment of the EU to human rights, in the Maastricht Treaty of 1992, and that the Copenhagen criteria for the accession of new member states to the EU, established in 1993, included the respect of democracy and human rights. The idea of an European Charter of Fundamental rights was being surfaced, after the European Court of Justice had rejected the initiative of the Commission for the accession of the EU to the European Convention of Human Rights. Ten years later, the Charter of Fundamental Rights adopted in 2000 was given legal force by the Lisbon Treaty, which also requires that the EU accedes to the European Convention of Human Rights. With these two crucial steps, the EU became the first supranational political entity to be bound both by a bill of rights and by an international convention of human rights, including an international court of human rights, which originally were established for sovereign states. The same development occurred with the democratic dimension of the Union. Whereas the Maastricht Treaty had created the European citizenship and the attached citizenship rights, the Lisbon Treaty added to the Union Treaty a chapter on democratic principles setting up the constitutional foundations of the representative democracy ant the participatory democracy in the Union. With these developments, E.ma and EIUC became even more important in view of the enhancement of human rights and democratic awareness in the Union, as well as the providing the Union with the necessary HR high skilled experts and professionals. This is the more so today, if we take into consideration the damage that the recent deep financial crisis brought to economic and social rights in several EU Member states, and the new frontiers of human rights pushed by technical, societal and cultural developments (gender and sexual related rights, privacy and the internet media, euthanasia, religious radicalism, etc. ), as well as the current direct challenges to HR, democracy and rule of law in a number of member-states, particularly regarding the surge of terrorism, the rise of populist movements and of racism and xenophobia, and the humanitarian response to the flood of refugees crossing the Mediterranean. Also, at the borders of the EU “illiberal democracies” or sheer autocracies defy the very notion of democratic freedoms. Once again, we need in Europe a solid political and practical commitment to HR and democracy, strong enough to counter the rise of doubts and even skepticism regarding the value of HR enjoyment and the effectiveness of democratic values. Unfortunately, we can no longer take HR for granted as we were led to think two decades ago. As privileged members of the EU HR community with a mission to fulfill, we have the obligation to stand up and raise the banners of the European constitutional values now enshrined in art. 2 of the TUE. The second mission given do E.ma/Eiuc was to implement the global HR policy of the EU. When E.ma was created, the world political scene was the most favourable to the expansion of HR since the II Word War. The so-called “third wave of democratisation” and the fall of the Berlin Wall broadened dramatically the geographical scope for constitutional democracy and human rights. In 1993 the Vienna Declaration on HR recovered the key notions of indivisibility and universality of HR, which had been lost during the Cold War. In Europe the EU evolved, with the Maastricht Treaty and the Lisbon Treaty, from a single market into a supranational political entity with a common foreign and secutiry policy (CFSP), including the promotion of human rights abroad. For the first time, the conditions were set for the fulfilling of the dream put forward by President Roosevelt, in his famous “four freedoms” address back in 1941, during World War II, to acknowledge and to respect the fundamental freedoms of everybody, “everywhere in the world”. This universalistic endeavor is even more needed today, because of the spread of economic globalization, which does not need only to be regulated by international law regarding its trade and investment and financial aspects. It needs to be accompanied by a globalization of human rights, including not only personal rights and public liberties, but also labour rights and economic, social and cultural rights. The new field of “international business and HR” should be one of the major concerns of the HR discourse today. The world-wide respect of HR requires the establishment of a world awareness and culture of HR. The EU shares this view. That is why, together with the internal dimension of HR and democracy in the Union, a second pillar was created with the consideration of the promotion and defense of HR and democracy in the external action of the Union, be it the CFP, the trade policy or the development cooperation policy. This is now explicitly established in art. 21º TUE, after the Lisboan Treaty. Again, in this fight for the universalization of HR, E.ma/Eiuc remains an indispensable mechanism for the promotion of the EU values and the implementation of the EU policies pertaining to HR and democracy in its different external action policies. With this development, a new task was conferred to E.ma and EIUC, which was to encourage and provide academic and financial assistance to the establishment of similar regional inter-university HR programs and centers, namely in the Balkans (Sarajevo), Africa (Pretoria), Latin America and the Caribbean (Buenos Aires), the Caucasus (Yerevan), the Arab World (Beirut) and Asia-Pacif (Bangkok). An innovative Global Campus on HR, bringing together all these structures, was established in Venice in 2012, by the initiative of EIUC, responding to a request from the EU, and under the direction of a council comprising all the regional HR programs and centers. The new role of E.ma/Eiuc is to cater and to be the focal point of this network of regional HR centers and teaching programs. We have now a global role and responsibility. Considering the diversity of initiatives organized by Eiuc, which go much beyond E.ma (like the "Venice HR academy" and the "Venice HR school") and the added value of the overseas regional HR programmes, looking at the many E.ma graduates who have joined us today to celebrate our 20th anniversary and the enthusiasm of the new "masterini" who now begin their academic year, I feel that 20 years ago we could not have expected so much and that the most ambitious dreams have been vindicated. We began with 10 universities, now we are 41 in Ema, due to the subsequent enlargements of the Union and the admission of two universities from each member-state. Others would like to join. All along these years we have graduated more than 15 hundred students, most of whom are busy in HR related jobs, manly in international organizations, EU institutions and bodies, Government organizations and NGOs. While E.ma and Eiuc remain the backbone of the EU HR community, these HR graduates are the army on the ground and the key evidence that the investment of the EU and of our universities is being rewarded. They are our most valuable asset. But we need now to look forward to the horizon of the next twenty years. The fight for HR and democracy is a never-ending story. New frontiers will be open, additional hurdles and challenges will arise. In order to deliver, we need vision and political will and sufficient financial resources, but also an appropriate institutional setting. We need no revolution; rather we should elaborate upon and further what we already have. It appears to me that Eiuc and E.ma have not exhausted their mandate. They have been - and in my view, should remain -, so to say, EU dedicated institutions. However, the new universal frontier of our mandate requires the setting up of a body that brings together the several existing networks of regional HR centers and programs, with their different needs and conditions, mainly supported and funded by the EU. In order to tackle the legal difficulties and institutional resistances, we need imagination, determination and compromise. But this is the stuff E.ma and Eiuc are made of, since the very beginning. Once again, we will need them in order do what needs to be done. I am sure we will succeed once again! '"Mário Soares, líder fundador do PS, da liberdade, da democracia. Quem quis e pôs "A Europa connosco". Socialista pelos direitos humanos, pela Paz. Se tivesse de ter cognome na História de Portugal, seria "o Resistente". Porque quando outros se acomodaram, contestou e lutou. Quando tantos calaram, gritou. Quando quase todos não viam ou não queriam ver, conspirou, federou, organizou. Por Portugal, livre e democrático. Na Faculdade de Direito em que entrei em Novembro de 1972, um mês depois de a PIDE ter assassinado o estudante Ribeiro Santos, juntei-me à gente mais aguerrida contra o regime (mais tarde percebi a ligação ao MRPP). E ali me cruzei com João Soares, parecido com o pai exilado, sempre disponível para todas... Fomos suspensos por "actividades subversivas" no mesmo dia 24 de Janeiro de 1974. Três meses depois, naquele extraordinário 25 de Abril, cruzamo-nos no Carmo, frente à PIDE, à noite em Caxias. Ainda não se sabia no que aquilo ia dar e João já tinha os pais no comboio, a regressar do exílio em Paris. Meus pais e meus sogros estavam na multidão que os esperava em Santa Apolónia. No primeiro 1o de Maio, estávamos todos juntos a ouvir Mário Soares e Álvaro Cunhal. O 25 de Novembro de 1975 foi a última crise que vivi no MRPP - com Soares, "burguês" mas democrata, contra o "revisionista" Cunhal, pela democracia, contra o "sol da URSS". Andei depois anos a ouvir críticas a Mário Soares: no MNE (concorri em 1980, graças ao ministro Mário Soares que em 1975 abrira a carreira diplomática às mulheres! ) e fora dele. Uns diziam que era da CIA, outros atacavam-no pela descolonização, pelas querelas partidárias e com o MFA, Conselho da Revolução e entre São Bento e Belém (onde eu, jovem diplomata, servia com orgulho e lealdade o Presidente Eanes), no ZAP (a candidatura de Zenha, velho amigo que Mario não apoiou). Mas todos os grandes personagens com quem convivi, por muitas discordâncias que tivessem, nunca deixaram de respeitar, admirar e até de se extasiar com o "animal político" Mário Soares: destaco o saudoso Ernesto Melo Antunes, seu parceiro na condução da descolonização possível e na construção do quadro institucional democrático. Para quem trabalhava com Eanes, o Primeiro Ministro Soares não mostrava especial interesse por Timor Leste. Mas no final do mandato e já candidato a PR, em Novembro de 1985, o PM Mário Soares foi à Nunciatura almoçar com Monsenhor Ximenes Belo, em visita secreta. O que ouviu teve impacto: o Presidente Soares impôs no Conselho de Estado de 29 de Julho de 1986, para choque do PM Cavaco Silva, pergunta sobre autodeterminação num "referendo" que há anos vinha sendo negociado na ONU para "arrumar a questão" nas "eleições" indonésias de 1987. O projecto sem princípios caiu por terra. Passou a ser estimulante discutir com o Presidente Soares o processo de Timor: ele sabia não poder desperdiçar-se nenhuma oportunidade, nem abdicar-se de valores e princípios. Em 1995, depois de Oslo e Madrid, Mário Soares foi o primeiro Chefe de Estado a visitar oficialmente Israel e a Autoridade Palestina, projectando pernoitar em Gaza. 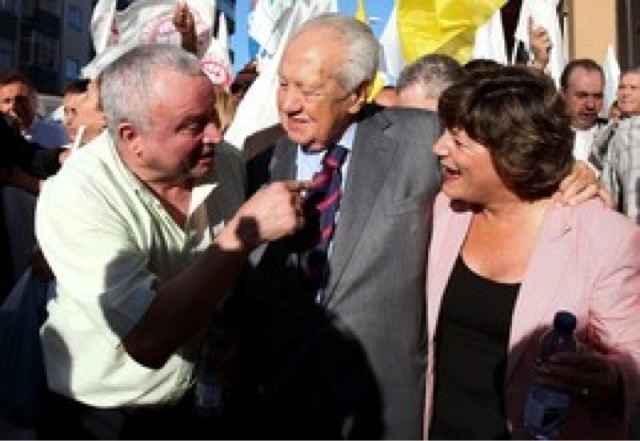 Estava com Arafat quando foi alvejado o PM Rabin, de quem se despedira de manhã em Telavive. Vivi em Gaza, junto de Mario Soares e de sua Mulher Maria de Jesus Barroso, aquela noite de pressão e angústia para todos, incluindo Lisboa, de onde o PM Guterres propunha despachar um avião para recolher Presidente e comitiva. Que lição de serenidade! Atravessamos Gaza sob tensa escolta na manhã seguinte. Do Sinai, o casal Soares voou para o funeral do seu amigo Rabin. O Chefe de Estado português pernoitara em Gaza, como planeado. Em 2004, Mário Soares aceitou convite do SG Ferro Rodrigues para mandatário da lista PS para o Parlamento Europeu que o Prof. Sousa Franco encabeçava, seguido de António Costa e de mim. Aproximara-nos sermos contra a invasão do Iraque, que dividia na Europa, em Portugal e no PS: Mário Soares apoiara-me, como Secretária Internacional, contra quem fazia coro com a direita de Durão Barroso no poder e acusava de "anti-americanismo" quem denunciava a desastrosa aventura. Quando me ligou em 2005 a pedir-me apoio para se recandidatar a PR, disse logo que sim. Ele intuia o risco, mas corria por gosto, percorrer o país e ouvir as pessoas não o cansava. Passei a visitá-lo para conversarmos sobre a Europa, o mundo, o país, o PS. Queria saber e discutir, ideias, pessoas. Era amigo, encorajador: "Você não desista, não se cale, resista, dê-lhes, siga em frente!". Alento que também sempre recebi da Sra. D. Maria de Jesus, empenhadíssima em que se ouvissem mais mulheres na política e, sobretudo, no PS. Foi Mário Soares, que nos idos de 80 alguns diziam homem da CIA, que em 2008 me convidou a acompanhá-lo a apresentar um livro sobre os "voos da CIA", o programa de tortura em Guantanamo e nas prisões secretas. Era o resistente, sempre de volta. Em artigos publicados nos últimos anos, resistiu alertando para as perversões que via comprometerem o projecto europeu e voltarem a trazer guerra à Europa. À hora a que escrevo o coração ainda resiste, mas pode parar. O espírito do resistente Mário Soares, esse, vai continuar a pairar e a inspirar gerações de portugueses e de cidadãos do mundo." "Outrageously, MEPs are being barred from visiting fellow Turkish Parliamentarians in prison: 10 from HDP. Plus 37 mayors of Kurdish cities jailed, besides thousands of journalists, judges, teachers, officers alleged to have links with the July coup. The EU should be alarmed and warn against the mass murder likely in preparation of prisoners whom Erdogan considers linked to the Gülen Movement. Already 20 appeared "suicided", certainly to hide traces of torture. Already pro-government media report of a "mass escape" plan by prisoners - a convenient excuse to execute them. The EU must ditch any pretense that accession negotiations are still possible with the repressive regime of Erdogan in his latest crazy power grab. Let's instead engage and support all those brave men and women in Turkey who fight for democracy and human rights and resist: we cannot be friends with a regime that brutally attacks the Kurds and oppresses the Turkish people." "Nationalism and populism in Europe, its neighborhood, the USA and in the world demand that we ditch the neo-liberal policies which are destroying jobs and deregulating globalization, thus feeding the Farages, Trumps, Erdogans and their KGB master Putin. Enlargement can only remain a priority with countries wanting to embrace European ways and values. As you said, Commissioner Hahn, this is not the case today in Turkey, under Erdogan. It's Erdogan, not the EU, who is closing the door, with gross human rights violations, heavy repression, abandon of the rule of the law. As a consequence - and as our Turkey rapporteur, Kati Piri, called for - negotiations should be frozen. But that also means that we need to engage even further with civil society and all political forces in Turkey who fight to restore democracy and the rule of law. Will the European Commission help?" "Idomeni, hell on Earth, died, they say. The Greek authorities, who initially promised to take a week to relocate people to official fields, announced already last Wednesday that “the job was complete”. But did it really die? On the same day that "the miracle" was declared I was in Thessaloniki, on the way to the border. I managed to pass the first police control but was not as lucky at the second one. The reality, however, is so blatant that there is no way to control or bypass it. Idomeni is not dead – it broke into a thousand pieces. Tents and people accumulate now on the side of the road just a few kilometres from the border, in gas stations, abandoned houses and any other vestige of humanity left. Hundreds (thousands?) fled to the mountains, fearing forced deportations, and families were broken apart in the process, adding to the already horrendous number of unaccompanied minors. 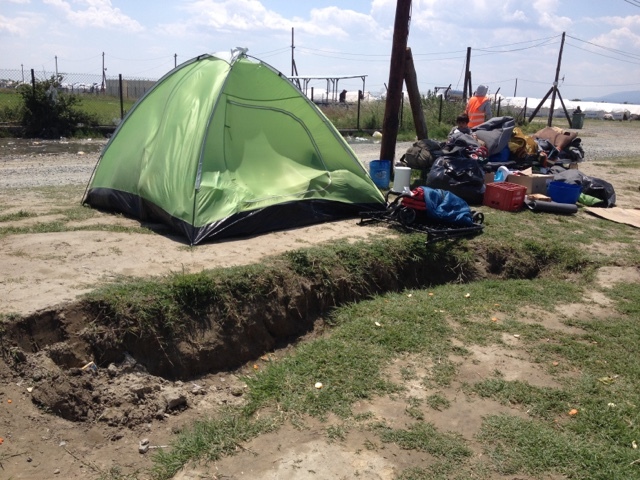 The improvised or overcrowded official camps do not offer basic conditions of dignity. 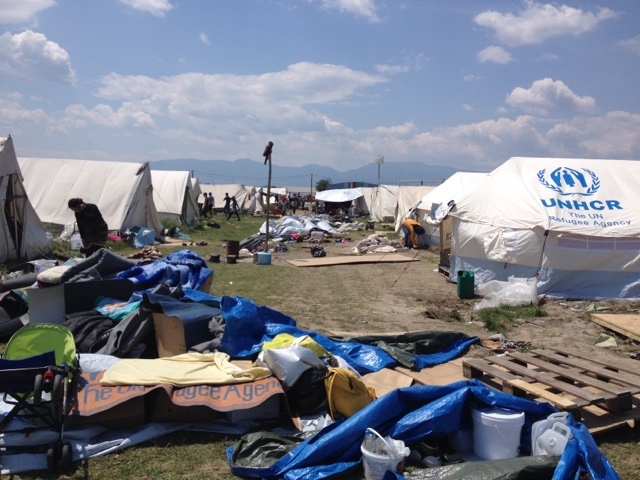 Idomeni may have been emptied but it is far from dead. I travel with Vasilis, a Greek journalist/activist with no affiliations who lived in Idomeni for 22 months, constantly trying to denounce the situation, and João (fictitious name), who arrived in Greece by boat and introduced himself as Syrian citizen to the authorities, knowing that his real nationality would automatically bar him entry into Europe, land of dreams. With João I share the birth year – 1990 - and the dreams of building a family, have a job, go to concerts. That is what we talk about for most of the time - his fiancée (still in his country of origin), how he does not want to go back poorer than he came, his BA in management and administration that he abandoned just one year before graduation. The border is on the horizon. "See those houses there?" – asks João - "it is Macedonia (FYROM). I tried to cross twice but was caught and brought back. I was too late, a week after the closing of the border..."
A few kilometres away, in Evzoni, we find the wild camp Hara Hotel. Some teenagers are trying to take water from the engine of a truck to wash their feet. There are tents everywhere. João tells me that at Idomeni he “showered" every 15 days. As Ziah, many other smugglers operate here. Hotel Hara is the main headquarters of operations, it is no secret. It all happens in broad daylight, right in front of me, for all the world to see. Shadowing some of the tents there is a giant advertising sign announcing "Welcome to Greece!” God bless Europe. 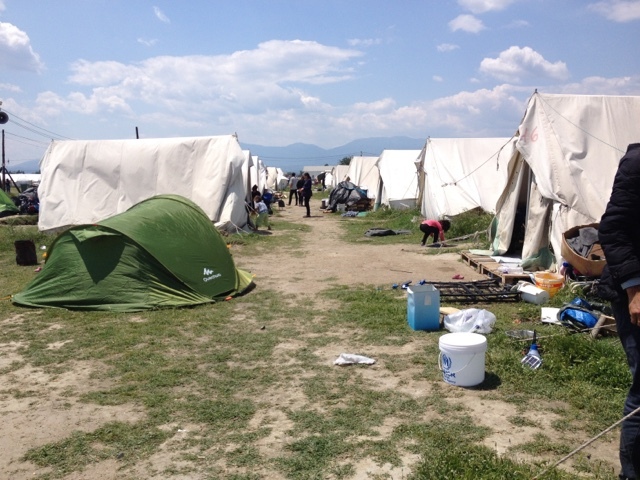 We continued to Nea Kavala, an official camp controlled/managed by the army and where we find some of the big international names (UNHCR, Save the Children, the Red Cross). We get in thanks to Vasilis, who knows and is respected by everyone: refugees, authorities, smugglers. The camp is hot, located on a sandy and desert ground, without shade, windy. Infested by flies. There is no end to the tents I see, and I see nothing but tents. The first person I meet is Hanan, who arrived yesterday from Idomeni (this camp received 79 relocated refugees). She is 28 years-old, has 3 children (2 girls,12 and 10 years-old, and baby boy, 8 months), and speaks "no good English". Sara (the eldest daughter), on the contrary, speaks an amazing English and volunteered to do the translation. She explains she learned by questioning volunteers about individual words and set phrases, in Idomeni, since her parents needed help understanding. Hanan wants to get out of the camp, even if it is back to Idomeni. They were settled there, they knew where to find food and water. Yesterday they could not feed themselves and today Hanan has no milk in her breast for the baby. "Are you from Portugal? Take us to Portugal!". The father shows up and raises his arms: "Cristiano Ronaldo!". Vasilis tells me this is the first time one hears of a destination other than Germany in these camps, and that Portugal won a place in the dreams of these people. But they say they do not know what to do, no one contacted them and they do not know how or where to ask for help. The group of Yazidis I meet in one of the tents, where I am the only woman, want to go together - no matter where, as long as they go all together. They are afraid that their culture will disappear completely. "Guantanamo Bay is better than here". There are rumours that a pre-registration programme will start in the camps, but the information is rather conflicting. For the time being it works (or does not) via Skype, in a reduced timetable with languages plots, and days go by with no one answering. In MEPs Ana Gomes and Josef Weidenholzer offices we have been in contact with this group for already two months, pressing the authorities (Greek, Portuguese, European) for their relocation to Portugal, after becoming aware of their deplorable situation as a religious minority particularly persecuted by Daesh terrorists. As we leave, there is a family arriving at the camp’s entrance. The father asks to be allowed in, explaining his brother is living there. The army offers a car to take them to another camp, since this one is full. The father insists: "My brother is here and we came on foot from Idomeni". I did not stay for the outcome but there does not seem to be much room for negotiation: "You cannot choose in which camp you want to stay". If family reunification does not work here, how will it work at European level? Last but not least, EKO station, another illegal camp at a gas station, known as "Resort EKO", family-friendly, by contract to Hara Hotel. In one of the tents, a child shows severe breathing problems. “Sometimes is good to be sick” - someone explains - “you can be considered a vulnerable case”. Until it is too late. Many organisations and Greek citizens, like Vasilis, try to restore some humanity. In Poligasó, a small village, the first Creative Lab for refugees is being set up, under the slogan "integration needs participation". Oikopolis and Solidarity Now have their headquarters in the same building in Thessaloniki. Two organisations, the same goals. They provide everything: legal counselling, language classes, clothing distribution, and the Idomeni canteen, Oikopolis’ main project which served up to 12000 meals a day. Dimitar, a volunteer, is pleased with the closing of Idomeni but worries about the people that have not been relocated in camps. "How will we be able to get the food to them?". Idomeni did not die. As Europe, it broke into a thousand pieces". "The Kyenge-Metsola report proposes solidarity and common sense. That is the opposite of what I have seen at Idomeni, where thousands are camping wildly and where yesterday men, women and children were miserably attacked by forces of neighboring FYROM. That is the opposite also of the EU-Turkey agreement, centered in forced returns, which makes the EU violate international law and human rights, also by detaining thousands at "hotspots" such as the one in Moria, Lesbos, which I have visited - in fact, a detention center. It does not deter refugees from coming and it gives more business to the trafficking mafias. Without announcing it, Chancellor Merkel does the opposite of what she proclaimed last summer: yielding to populism and making the Union deport asylum seekers. That is why European Commission and Council do not sanction the Visegrad members, who shamefully led by Austria gang up to violate Schengen, closing borders, asphyxiating Greece e now building walls with Italy. This is not a refugee crisis. It is a European crisis - of leadership and values. I am ashamed!" My statement at the EP plenary debate, this morning, on the Metsola-Kyenge report on "The situation in the Mediterraneum and the need for a holistic EU approach to migration"
Over 50.000 asylum seekers are now stranded in Greece, since a group of EU Member States ganged up to close the borders and barr the so called "Balkans route". People are desperate, nowhere to go and refusing to be sent back to Turkey or to the wars and terror they escaped from, after costly and dangerous journeys to get protection in Europe. With three other S&D MEPs - Tanja Fajon, Paul Tang and Miltos Kyrkos - I visited last weekend several refugee camps in Greece to find out the problems and figure the implications of the EU-Turkey agreement of March 17. We were in Lesbos, where we visited the Moria "closed facility" and the Kara Tepe camp run by the municipality; in Athens we visited refugees squatting at Piraeus and in the organised camps of Schistos and Eleonas; and in Thessaloniki, se were at the government-run camp of Diavata and the wild camping site of Idomeni, on the FYROM closed border. I came back with admiration for the Greek people, civil society and authorities. Despite being under terrible duress and deprived of resources by the austerity policies, through their solidarity and hospitality they are saving Europe from worse disrepute. The Greek State cannot hire staff to reinforce civil protection, immigration, asylum or police. And it is the Greek Army who is providing infrastructure and logistics and securing organised camps and "hotspots" opening up throughout the country to lodge refugees. I reinforced my belief that the EU-Turkey agreement is impracticable: people are not supposed to stay in detention beyond 25 days, but then they will be released and sent out into another limbo, since it is highly unlikely that their asylum requests will be successfully completed, even less judicially appealed, during that time lapse. Neither will relocation into another EU Member State happen in significant numbers, since very few offers for relocation have been made (Portugal, my country, is a rare exception of a proactive Member State wanting to do more than its fair share). And very few Greek and EASO officials are available to match requests and offers, even less to organise the transfer of people into another country (since October only about 1000 Syrians and Iraqis were relocated into other EU MS). In fact, a major problem which EUCO and EC grossly underestimated was the fact that Greek Immigration, Asylum and Home Affairs officials are dramatically overstretched, with a huge backlog in processing asylum requests for years. And, even if, as intended, priority is to be given now to Syrian and Iraqi refugees, it will be hard to speed up significantly the process. Enough to explain that if refugees want to apply for asylum, or relocation, or family reunification, they will have to do it ...via Skype! And often camps do not have even functioning Wi-Fi, not to mention the difficulty to effectively establish the Skype connection. At the Schistos camp, in Athens, where Wi-Fi works, we were told that if anyone manages to establish the Skype connection today, at best he/she will have a first interview scheduled for...next June! And news of deportations (confirmed by the first occurred April 4th) are dangerously disquieting for people in camps, causing even more frustration and confusion, all that fuelling anger and violence, including domestic violence, sexual exploitation of women and children and further exploitation of refugees by traffickers. And traffickers roam around in camps: in fact the EU-Turkey deal may give them even more profit, they are already adjusting to the needs, opening up new and more dangerous routes. The only way that would dry out the human traffickers sordid business is the one that the EU Council till this days has ignored, despite much demanded in the European Parliament: opening safe and legal ways for asylum seekers and migrants to apply for protection/admission in European countries. 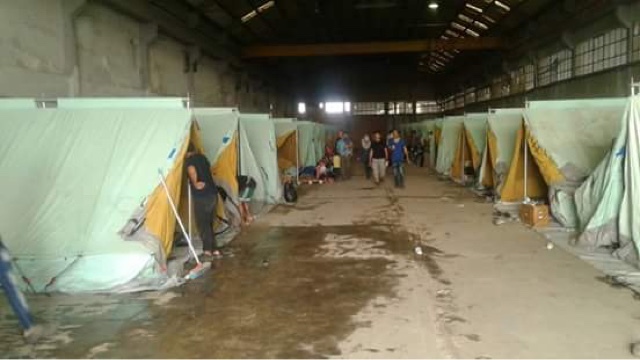 UNHCR, MSF and other non-governmental organisations decided to withdraw most services (except the protection teams) from some camps, namely the "closed facilities", in order not to be complicit with refugee detention and forced returns. 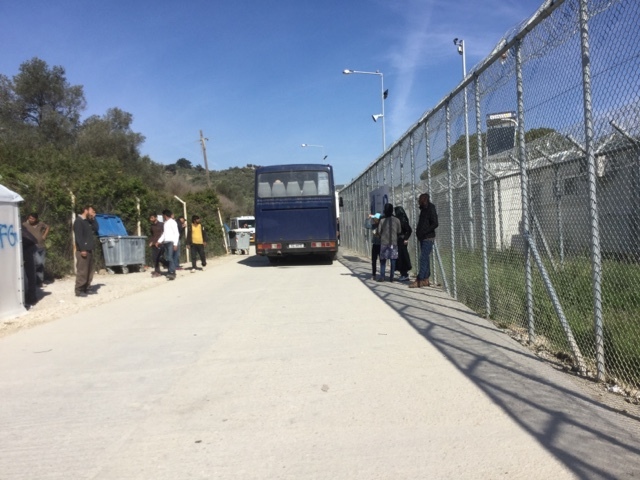 News of forced returns cause panic and may soon lead to uglier scenes in the camps: all staff attending to the refugees told us that people adamantly refuse to be sent back to Turkey, some even threatening to throw them selves to the sea and drown. UNHCR, besides, contests the notion of Turkey as a "safe country". Or that any country can be deemed "safe" for anyone or all from a certain nationality: according to the Refugee Convention, every person has the right to request asylum and have the case considered individually. And at least for Iraqi, Syrian or Turkish Kurds, Turkey is clearly not a "safe country". But considering that EUCO and EC intend that priority to be given to Syrian and Iraqi refugees, what will happen to the Afghanis, Pakistanis, Iranians, Eritreans and Congolese and others that we met in many camps, mostly arrived before March 20? How can they be returned to Turkey or to any other country without being given the chance to apply for asylum, relocation or family reunification? And the fact is that most of the people who, we have met in the camps told us they knew nothing of those possibilities, they had asked for protection and had not been given a chance or an interlocutor to submit any application, even less by skype!...In the Schistos camp alone, over 2000 men, women and children from Afghanistan agonize in the limbo. Idomeni is the nastiest face of Europe today. As a sign ominously read by the long, dense and raucous line of people waiting to get some food: "Human Rights Don't Apply Here". 11.000 men, women and children are stranded by the closure of the border and for two months living in flimsy tents in the mud. The camp is a sort of Wild West tent city, some refugees already improvising shops... The trafficking rings roam around, instilling the illusion that borders could reopen at any moment. 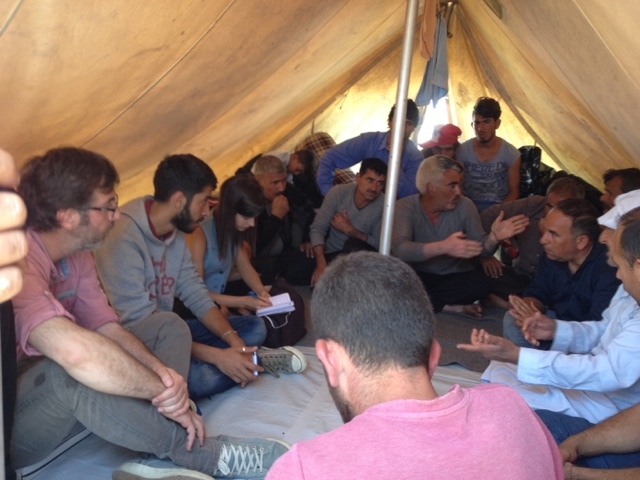 The 28 UNHCR staff present and the EASO team visiting are overstretched, unable to reach out to most people to persuade them to be relocated to more structured and safe camps. And be prepared to wait there... For what and when, nobody knows! officers try to persuade people to register and understand that there are three options: reunification with relatives (I met several women with children claiming to have their husbands in Germany or Sweden), relocation and asylum in Greece. When any of those will happen or at least their formal request will start to be processed - nobody knows... That adds to the general sense of helplessness that is building tension, inclusively against officers attending to the refugees' needs. As we saw on our way to Idomeni. The main road was blocked by squatting refugees in hundreds of tents near a gas station. A truck approached and was forced to stop by dozens of children and adults crying out "Open up the borders". Minutes later the truck was let to pass. But a child waved a bottle with gasoline and threatened to throw it at the truck; two people used a similar to set themselves on fire in Chios last week... Worse may come to shame us all, Europeans, even more, for our incapacity to manage a problem that much poorer and vulnerable countries, such as Jordan, Lebanon and even Turkey, have managed with more compassion, competence and political will. Encouraging, that there was no sense of hostility towards us, Europeans, as we passed through the camps and talked to the refugees in so stressful and nerve wrecking situation. On the contrary, people were welcoming us with smiles and patience, some eager to tell their story and to show us their babies. In the middle of so much distress and misery, some even managed to display a sense of humour. Like the Palestinian men from Yarmouk camp (Syria) at the Diavata camp who replied, when I asked where they wanted to go: "Alemanya??? What Alemanya!! Considering what we went and are going through now, we would rather go to ...Senegal!" Indeed, what "Alemanya"? What Germany? What EU? Frau Merkel may have had good intentions, and even a strategic sense of Germany's and Europe's demographic needs, when she announced her country's open door for refugees fleeing Iraq & Syria war last summer. But in view of the afflux it generated and the crisis engineered by the refusal of other EU Member States to share the burden and closthe borders, she chose...to outsource the problem to Turkey. 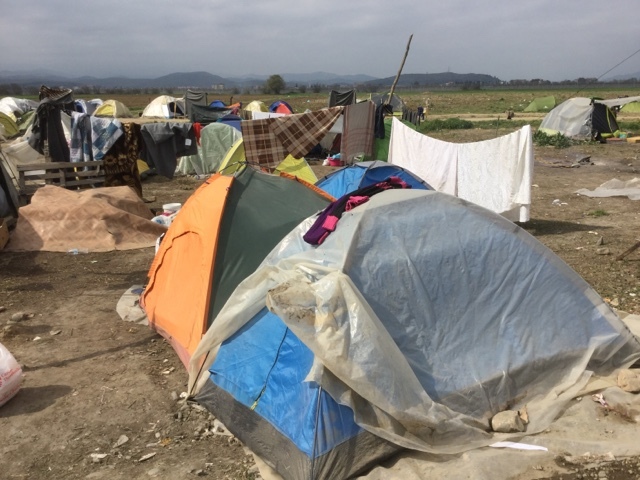 Transferring the people from the abject conditions at Idomeni into other more structured camps in Greece and into other EUMS must be a priority. But, ultimately, the crisis can only be solved when borders will reopen and the Schengen controls will be restored and reinforced. The same German authorities and the same EC that nastily threaten countries like Greece and Portugal for not being able to reach decimals as per the Fiscal Compact in aleatory budget deficit targets, did not lift a finger till this day - for instance proposing to suspend European funds - against Hungary, Austria and other Visegrad Member States which ganged up to violate the Schengen Agreement by closing borders and by asphyxiating Greece with the escalation of this crisis. This is not my Europe, the one that I used to be proud of, the one that I want to help build. And if this is German Europe, then it is committing suicide. Com três outros eurodeputados socialistas (a eslovena Tanja Fajon, o holandês Paul Tang e o grego Miltos Kyrkos) visitei vários campos de refugiados na Grécia no passado fim-de-semana, para ver com os próprios olhos os problemas no terreno e perceber as implicações do acordo UE-Turquia, de 17 de Março. Fomos a Lesbos, onde visitámos o "hotspot" - designado de "centro fechado" - de Moria e o campo de refugiados gerido pelo município local em Kara Tepe; visitámos os refugiados no acampamento selvagem no Porto do Pireu e nos acampamentos organizados de Schistos e Eleonas, em Atenas; e vimos, em Salónica, o campo de Diavata gerido pelo governo grego e o acampamento selvagem de Idomeni, na (fechada) fronteira com a Antiga República Jugoslava da Macedónia. Primeiro, o povo grego (sociedade civil e autoridades), apesar da dureza da situação e da escassez de recursos (o Estado não pode contratar pessoal para reforçar a protecção civil, os serviços de imigração, asilo ou policias, por exemplo), tem sido admirável e tem, com a sua solidariedade e consciência social, salvado a Europa de pior descrédito. O próprio exército grego está a providenciar infra-estruturas, logística e segurança nos campos organizados pelo governo e nos "hotspots" a serem estabelecidos nas ilhas para albergar os refugiados lá bloqueados. Em terceiro lugar, confirmei que o acordo UE-Turquia é impraticável, não vai funcionar, pelo menos nos prazos irrealistas estabelecidos pela Comissão e Conselho: supostamente as pessoas não devem ficar em detenção para além de 25 dias. Expirado esse prazo terão de ser soltas, embora continuem no limbo, já que não é provável que os processos dos seus pedidos de asilo sejam concluídos nesse tempo, quanto mais reanalisados, em caso de recurso judicial que têm o direito de interpor. Tão-pouco a recolocação dos refugiados para outro Estado-Membro da UE está a funcionar, uma vez que poucas ofertas para acolhimento foram feitas (Portugal é caso positivo raro e é reconhecido como tal) e há escassos funcionários gregos e da EASO (Agência Europeia de Apoio ao Asilo) para articular pedidos e ofertas, e menos ainda para organizar a transferência de pessoas para outro país (desde Outubro, apenas 800 sírios e iraquianos foram transferidos para outros Estados Membros). Na verdade, Conselho e Comissão subestimaram o facto de os funcionários gregos da imigração, asilo e assuntos internos estarem dramaticamente sobrecarregados e levarem um atraso de anos no processamento de pedidos de asilo. Mesmo se derem agora prioridade a refugiados provenientes da Síria e do Iraque, será difícil acelerarem significativamente o processo. Basta dizer que, se os refugiados quiserem pedir asilo, recolocação ou reunificação familiar têm de o fazer ... via Skype! E muitas vezes os acampamentos onde estão os refugiados não têm sequer wifi a funcionar, já para não mencionar a dificuldade de estabelecer a conexão Skype. No acampamento de Schistos, em Atenas, onde o wifi está a funcionar bem, se alguém consegue estabelecer a ligação Skype, na melhor das hipóteses ele/ela terá uma primeira entrevista agendada para... Junho! Se Conselho e Comissão querem, de facto, ajudar a Grécia a acelerar o tratamento dos processos de asilo, recolocação e reagrupamento familiar, devem reforçar urgentemente a capacidade da Grécia com especialistas em processo de asilo e apoio técnico nas ligações Skype e wifi nos campos. Ouvimos que os membros do Conselho Europeu prometeram enviar para Grécia peritos. Para reforçar a EASO e agilizar o processamento de candidaturas a recolocação e asilo, embora estejam prometidos 400, só chegam 35 esta semana... Mas, em compensação, para reforçar o Frontex, com a finalidade de acelerar retornos forçados/deportações para a Turquia, chegam muitos mais. Deve ser para dar mais oportunidades do sórdido negócio às redes de traficantes, pelas mesmas ou por novas e mais perigosas rotas! porque a verdade é que a única forma que poderia secar o lucro dos traficantes de seres humanos - a abertura de vias legais e seguras para os requerentes de asilo e migrantes submeterem os seus pedidos de admissão em países da UE - essa via o Conselho Europeu continua a não explorar. As notícias sobre os planeados retornos forçados inquietam as pessoas nos campos e causam mais frustração e confusão, alimentando a raiva e violência, incluindo a violência doméstica, a exploração sexual de mulheres e crianças e a exploração dos refugiados pelos traficantes, à solta nos acampamentos selvagens, como o de Idomeni. E perturbando também o modo de vida das comunidades locais (em Idomeni os agricultores não podem cultivar as terras ocupadas pelas tendas...). Tudo isto levou ACNUR, MSF e outras organizações não-governamentais a retirarem-se de alguns campos, nomeadamente dos "centros fechados", a fim de não serem coniventes com a detenção de refugiados e o retorno forçado. O que se anunciava e cuja primeira leva se concretizou dia 4 pode originar feias confrontações: todos os funcionários que estão a atender refugiados nos campos nos disseram que as pessoas recusam ser enviadas de volta para a Turquia e temem revoltas que tudo descontrolem. Mas admitindo que Conselho e Comissão pretendem que a prioridade seja dada aos refugiados sírios e iraquianos, o que acontecerá aos afegãos, paquistaneses, iranianos, eritreus e congoleses (RDC) que encontrámos em tantos campos e que chegaram, na grande maioria, antes de 20 de Março? Como podem eles ser devolvidos para a Turquia ou qualquer outro país, sem lhes ser dada a oportunidade de requerer asilo, recolocação ou reagrupamento familiar? E o facto é que a maioria das pessoas que encontrámos nos campos nos disse que nada sabia dessas possibilidades, que apenas haviam pedido protecção, não lhes tendo sido facultado qualquer via ou interlocutor para submeter os pedidos, quanto mais via conexão por skype! Só no campo de Schistos, em Atenas, há mais de 2000 homens, mulheres e crianças do Afeganistão a agonizar na indefinição. Inquirimos sobre procedimentos especiais para proteger menores não acompanhados - os números dos que continuam a chegar são alarmantes, sobretudo quando mais de 10.000 crianças são já consideradas "desaparecidas". As autoridades gregas estão cientes das tremendas vulnerabilidades, mas, uma vez mais, terrivelmente subequipadas para lidar com um problema desta dimensão. Peritos das ONGs tentam ajudar o mais que podem, mas admitem que nem mesmo os Procuradores de Justiça são suficientes para garantir a acompanhamento judicial dos menores. E em campos selvagens, como Idomeni, é óbvio que as oportunidades para a exploração infantil são intensas. Idomeni mostra hoje o rosto mais tenebroso da Europa: 11.000 homens, mulheres e crianças encalhados com o encerramento da fronteira e há mais de dois meses a viver em frágeis barracas montadas na lama. O acampamento está a tornar-se uma cidade de tendas, como um Oeste Selvagem, com alguns refugiados já improvisar lojas com sapatos usados ou coca-cola para vender. As redes de tráfico rodam por ali, incutindo a ilusão de que as fronteiras podem reabrir a qualquer momento. Os 28 elementos do ACNUR e as equipas da EASO estão sobrecarregadas, mal conseguindo chegar às pessoas para as persuadir a aceitarem ser realojadas em campos mais estruturados e seguros. Estando preparados para pacientar por lá... Para quê e quando, ninguém sabe. Oficiais da EASO tentam fazer entender às pessoas que há três opções disponíveis: o reagrupamento familiar (muitos afirmam ter parentes na Alemanha ou na Suécia), a recolocação e o asilo na Grécia. Quando é que qualquer uma dessas opções se vai concretizar ou pelo menos começar a ser processada, ninguém sabe... Isso contribui para a sensação geral de impotência que pode semear tensão, inclusivamente contra os agentes das organizações que tentam atender às necessidades dos refugiados. A caminho de Idomeni, a estrada principal estava bloqueada por refugiados em centenas de tendas perto de um posto de gasolina. Um caminhão aproximou-se e foi forçado a parar por dezenas de crianças e adultos clamando "Abram as fronteiras". Minutos depois, o caminhão foi deixado passar. Mas uma criança acenou com uma garrafa com gasolina e ameaçou atirá-la contra o caminhão; ora, em desespero, já um homem usou uma para se incendiar em Chios, na semana passada... Pior virá ainda, para vergonha de todos nós europeus, pela incapacidade de gerir um problema que países muito mais pobres e vulneráveis, como a Jordânia, o Líbano e a própria Turquia, conseguiram enfrentar com mais compaixão, competência e vontade política. Encorajador é que não encontrei nenhum sentimento de hostilidade em relação a nós, europeus, à medida que passei pelos campos e conversei com os refugiados em situação tão exasperante. Pelo contrário, todos nos receberam com sorrisos e paciência, alguns ansiosos por contar a sua história e por nos mostrar os seus bebés. No meio de tanto sofrimento e miséria, alguns conseguiam até ainda manter algum sentido de humor. Como o palestino vindo do acampamento de Yarmouk (Síria), agora a desesperar no campo de Diavata que respondeu, quando perguntei onde queria ir: "Alemania" ??? Qual "Alemania" !! Considerando o que passámos e estamos a passar, preferimos ir para ... o Senegal!" Com o acordo UE-Turquia resultante da pressão alemã, a Chanceler afundou a credibilidade da UE em relação aos direitos humanos e ao respeito pelo direito internacional. Como desculpa pode invocar que outros Estados-Membros da UE recusaram a solidariedade necessária: mas nisso também falharam Alemanha e os países do Norte da Europa, por mais de um ano a fingir que a crise era italiana, maltesa ou grega, e a negar estarmos diante de um problema verdadeiramente europeu. Acresce que a falta de solidariedade dos Estados Membros resulta também em boa parte de um fracasso da liderança alemã na actual UE sob sua hegemonia. Viktor Orban e outros governantes europeus recusaram-se a partilhar a recolocação de refugiados porque a Alemanha e o seu instrumento Comissão Europeia assim o permitiram: a mesma Alemanha e a mesma Comissão Europeia, que se viraram e viram ameaçadoramente contra países como a Grécia e Portugal por não cumprirem aleatórias décimas orçamentais dos compromissos do PEC, até hoje não levantaram um dedo contra a Hungria, a Áustria, o Grupo de Visegrád que juntaram para pôr em causa o sistema Schengen, asfixiar a Grécia e minar a imagem e os valores da UE ao fechar fronteiras para bloquear a rota dos Balcãs, com os refugiados já na estrada, seduzidos pelos anúncios de boas-vindas de Merkel. E assim temos mais de 50.000 pessoas presas na Grécia, desesperadas, sem ter para onde ir e recusando voltar para a Turquia ou para as guerras e terror de que procuram escapar, após as caras e perigosas jornadas que empreenderam até chegar à Grécia. Terra onde a Europa alemã hoje, verdadeiramente, se vê grega.